Environmental stochasticity is a key determinant of ecological dynamics, but little is known about its effects on biological communities, particularly the predictability of their response to perturbations. In this study, we found that different components of ecological stability showed predictable but distinct responding patterns to changing temporal autocorrelation of environmental stochasticity. During my first week in Dublin, Ireland, I was more shocked by the countless sunny-rainy shifts within one single day than its natural beauty, although I had been warned of its fickle weather in advance. That was something totally new to me. Born and raised in a small inland town in North China, I had grown accustomed to taking for granted that a whole sunny day could be prophesised by bright morning sunlight through the window. Then I started to imagine that, if fitting a curve to the weather, the curve of my birth village would surely be much smoother than Dublin, even though the former has four much more distinct seasons. But, at that moment, I had neither realized that this thought actually reflected the difference in the temporal autocorrelation of environmental conditions in the two places nor how this could be linked to the dynamics and stability of ecosystems. Comic picture credits to Petr Zika. My Ph.D. research started by investigating how the correlations between different stability components respond to different intensities of single perturbations. When talking about this project to people, I have been asked the same question many times: natural ecosystems seldom experience only one large perturbation but undergo continuous environmental variations. This encouraged me to recall my first impressions of the Irish weather and to think about the patterns of perturbations in nature. Extreme climatic events and single, static levels of globally-important disturbances such as global warming, fragmentation, and nutrient enrichment have tended to be the focal disturbances of choice for ecosystem-level studies of environmental change. Many of my ecologist friends have talked with me about how they set the temperature in the treatment several degrees higher to study the impacts of warming on ecosystem structure, functioning, and stability. One good reason for taking such a static experimental approach is, of course, the reduced (though still significant) requirement for energy and time. Yet, this approach inevitably overlooks the variations around the main trends in environmental conditions, which may accumulate to exert a large effect on natural systems or, indeed, cancel each other out. So how might the pattern of these variations determine the stability of populations and communities? While many interesting effects of environmental variation, particularly that of its temporal autocorrelation pattern (that is, the colour of the noise) on populations have been identified, how these patterns act to regulate stability at the community level was unclear. Okay, this is interesting, but how we can study the effect of these environmental fluctuations? We decided to use computer simulations. Facilitated by excellent computing resources in Trinity College Dublin, we were able to intensively explore how the response and predictability of different stability components are regulated by two key characteristics of environmental stochasticity – its temporal autocorrelation (colour), and the strength of correlations in the responses of species to it. 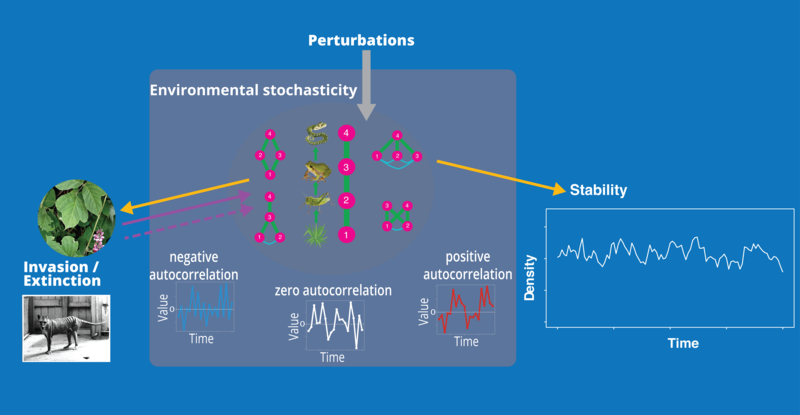 In our study, published in Nature Ecology and Evolution, we found that different stability components showed distinct but clear responses to changing temporal autocorrelation of environmental stochasticity. In contrast, the predictability of stability decreases consistently as the temporal autocorrelation of environmental noise becomes increasingly positive (also known as environmental reddening). The structure of natural systems and the myriad interactions between species are far more complicated than our model can possibly cover. We simplified many details to make our story simple and clear. However, our findings demonstrate that incorporating key characteristics of environmental stochasticity into our models is an essential step towards improving prediction in ecological systems. We look forward to more sophisticated models that include different patterns of environmental stochasticity to better reflect the real variation that occurs in nature.